When current levels become extreme it is very important to build a dependable controller of the device put under load, usually a large distribution transformer, and its ballasting device. The construction of this device is very important because your life may depend upon it. With voltages and currents one mistake will be lethal. The only responsible and sensible way to manage repetitive experiments with this equipment is to design a save and powerful controller that you can attach different loads and ballasts to. This controller is model #KMDD1. The large 100 AMP mains breaker interrupts the power in case of a massive overload . The power contactor needs 120VDC to actuate. The actuator will pull an arc over 1/4 of an inch when the relay transitions from the on to the off state. In order to power up the high current double pole double throw contactor there is rectifier and an intermediate relay on the board. The double pole, double throw, power activation, is wired as a power short circuit across the main load when it deactivates. Notice the 250 ampere wire that is used for these short time duration high current load disconnects. The power contactor turns the pole pig and ballast on in one position and sorts the load to stop power from bleeding back when you have to adjust the ballast. This is a very nice safety feature. When the relay is in the up position the relay shorts the pig. Here is a close up of the short circuit contactors. As you can tell, they can sink lots of current. Once this ballast controller has turned off, the power is removed from the high current circuit. Here is a close up view of the spring loaded contactors in the on position. This controller is super heavy duty. 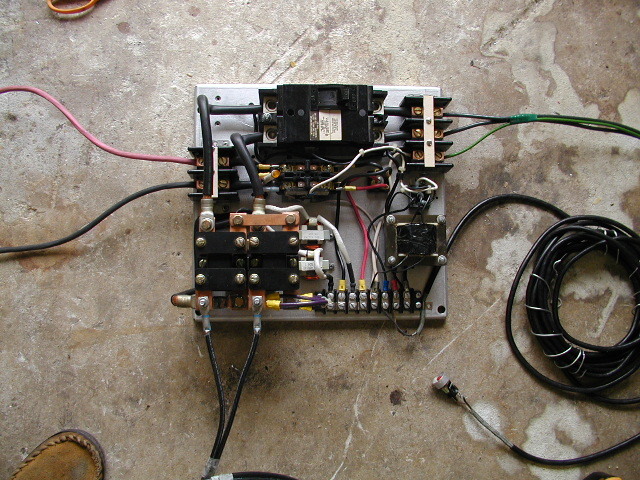 This is the reverse short circuit connection. Again you can see how heavy duty this controller is. This is where the ballast plugs into. It is all made of #2 wire. For short bursts it can easily conduct 250 amperes of current. Any combination of load transformer or ballast can be driven with this controller unit.